IF IT IS SO APPARENT that continued subservience to the European Union and the needs of its bank sector are imposing severe hardship on the majority of Irish people, and setting back our hopes of economic growth by a generation, why do the political parties, especially Labour, continue to sacrifice everything for the European ‘good’? The fact is that the hardship imposed by Europe’s austerity programmes is not felt equally by all sections of the population. The top 10% of our population have actually increased their share of the country’s wealth since the austerity programme began, while the bottom 20% have seen the most dramatic losses of income and wealth. In other words, parties that represent the rich or the better off (like Fine Gael and Fianna Fáil) are happy to continue bowing to Europe in the hope that by being ‘good boys and girls’ — the best in the class — they individually, and their likes, will get a share of the cream when the worst of the crisis is over. Fianna Fáil are now boasting that the tide has turned for them and two opinion polls in a row have shown increased support for that party, with Fine Gael dropping only marginally. Sinn Féin remains well above its general election figure, while Labour again shows the most consistent and persistent drop. Labour’s voters are disgusted with what their party is doing, and many Labour activists share that disgust — but where does it all leave the state of Irish politics? Since before and after the last general election, opinion polls have shown that parties and independent individuals which are in words or in deeds in favour of some form of socialism score 40% and more. A consistent united effort could push this to a majority share. But the Left is seriously disunited. Individuals and parties on the Right might disagree with and dislike each other intensely but they always come together to defend their class interest when it is necessary. The Left rarely does so. Given its shameful stance in Government, much of the debate centres on whether Labour can even be considered part of the Left. But the fact is that Labour has many committed members who are genuine socialists — not all of its TDs are opportunist careerists, and even the Labour ministers in Government have in the past argued coherently many of the Left positions they now ignore. We all know that the Labour ministers sold out their own party and their own principles for the sake of office. 2011 was the last chance that Gilmore, Rabbitte, Howlin and Quinn had of holding ministerial office as age will probably rule them out after the next election. We all know, too, that had Labour rejected coalition with Fine Gael, Labour would have been the leader of a united Left opposition with Sinn Féin, the ULA and other independents, and now very much poised to lead the next Government instead of facing the electoral drubbing that seems impossible to avoid. That did not happen but this Labour leadership will pass, and the hammering that Labour is due can be the opportunity for that party to refind itself. Roisín Shortall, Patrick Nulty, Tommy Broughan and others have shown that this potential exists. But this potential can only be realised if genuine Left Labour elements drop their atavistic anti-Sinn Féinism and, even worse, their anti-republicanism. They must understand that, as James Connolly pointed out, socialism in Ireland can only be built by a free people in a free country — not one subservient either to the British Empire or the European Union. 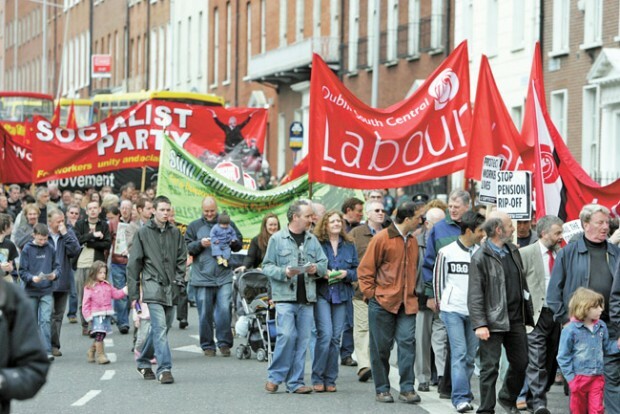 Labour is a crucial part of any future Left victory, for Sinn Féin on its own cannot do it. Part of the task today, then — while continuing to savage Labour’s betrayal of its own principles — is to work to develop a common understanding of Left unity among Labour rank-and-file and Sinn Féin. 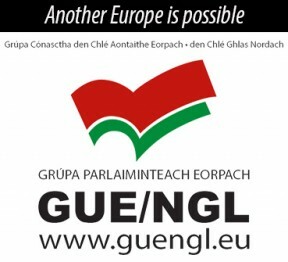 Playing a part for democratic equality in Europe, for example, will mean challenging the European federalist project supported by current Labour along with Fine Gael and Fianna Fáil. And championing democracy in Ireland will mean challenging the partition of our country and the sectarianism which British imperialism encouraged and used (and continues to use), as Connolly foresaw, to thwart that democracy. Next issue: The concrete projects of struggle that will be needed to rescue Labour from the stranglehold of reaction, and bring it to play its part in a successful push for power by a united Left.